Ion channels generate electrical and ionic signals that are the bases for neural activity, muscle contraction and various processes in cell biology. Approaches for controlled activation of specific ion channels can be used as therapies for various human diseases and tools for scientific exploration. This talk will show that chemical compounds that specifically modulate activation of a potassium ion channel may lead to the development of the next generation of anti-arrhythmic drugs. This talk will also show that ultrasound can open mechanosensitive ion channels, which provides a mechanism for ultrasound based brain stimulation and opens the direction for applying these ion channels as a tool for ultrasound based tissue stimulation when they are genetically introduced into the target tissue. 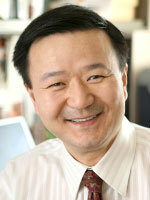 Jianmin Cui is Professor of Biomedical Engineering on the Spencer T. Olin Endowment at Washington University in St. Louis. He received Ph.D. in Physiology and Biophysics from University of Stony Brook and a post-doctoral training at Stanford University. He was an assistant professor of Biomedical Engineering at Case Western Reserve University before moving to St. Louis in 2004. His research interests are on molecular mechanisms of ion channel function and modulation. Prof. Cui received Established Investigator Award from the American Heart Association and is a fellow of the American Institute for Medical and Biological Engineering (AIMBE).